Today I am excited to announce the release of my new MM contemporary short story collection Beastly Businessmen and Guitar Gods. A little white lie, told in his job interview, won Sasha his dream role. Only now he faces a pile of work he doesn’t know how to complete. When someone comes along with a solution to his dilemma, he is thrilled. But what price will he have to pay? 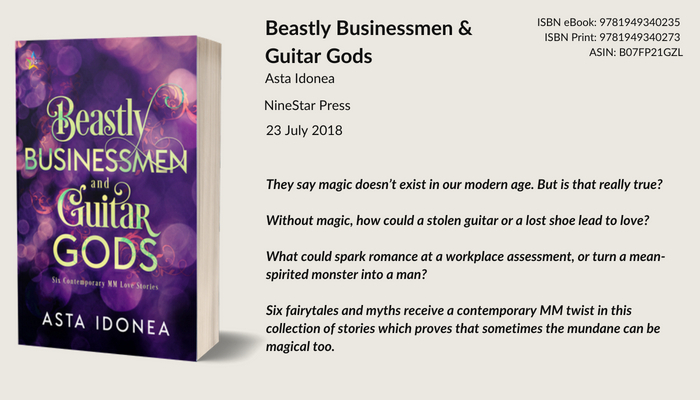 Retellings of fairytales and myths have become hugely popular in recent years, and I am following that trend with Beastly Businessmen and Guitar Gods. What is the lure of returning again and again to these stories? I think the answer lies in their archetypes. Fairytales and myths offer recognisable characters and situations that can be adapted with ease, slotting effortlessly into different settings and genres. They defy the aging process, their messages remaining relevant throughout the centuries, and they offer clear-cut plot markers that guide the writer on their journey. These stories also avoid the issues of tropes and familiarity that plague some books, as readers readily accept both in a fairytale context when they wouldn’t do so in, say, a YA dystopian piece. In retellings, familiar characters and plot lines form part of the appeal. We like to see out favourite stories recast in a new and interesting light, just as we enjoy retellings of the classics in either a humorous way or in a manner that gives voice to a different character than in the original work. With centuries-worth of literature out there, finding an absolutely original idea is the writer’s equivalent of a needle in a haystack. But that doesn’t have to be a bad thing. No one wants to read a story that seems a carbon copy of one they’ve already read, but, for me, retellings of fairytales and myths tend to fall on the right side of that invisible line. They offer the pleasure of returning to beloved stories of our youth, but having the opportunity to see them presented in a delightfully different way that gives them a sense of freshness. I certainly hope that readers will find something new and engaging to take away from my retellings in Beastly Businessmen and Guitar Gods. Mr Siskin looked up, his eyes burning with the fierce light of hope, and Dunstan felt a burst of pride. He had done this. With a mere handful of words he had reduced the man to a grovelling wreck, only to then transform him into an eager and obedient dog, begging at its master’s feet. It was so enthralling that he decided he would hear Mr Siskin out. Right now, Dunstan was like a god, and maybe he would even choose to be benevolent.